After months of anticipation, leaks, and rumors, the first beta version of Android Q is finally here. Developers can already start working on targeting the latest SDK version and supporting all the new APIs Android Q brings. But, most of the end-users are looking forward to the official stable release of the latest and greatest version of Android. 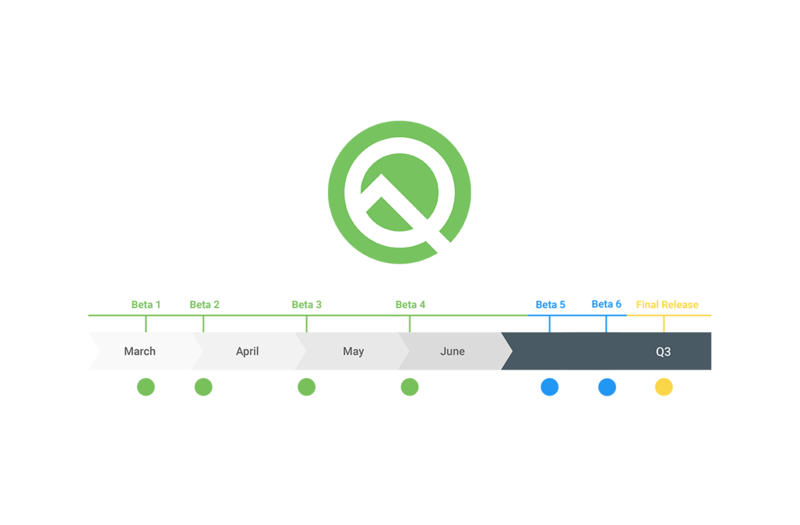 While we are still hard at work covering all the new goodies from Android Q, Google published the release timeline. Apparently, there will be a total of 6 Android Q beta releases. We saw the first update today, we’ll see the next releases in April, May, and June. After that, there will be 2 more betas, followed by the final release in Q3 of 2019. The exact dates/months of release for these three builds are currently unknown, but it does appear the next few releases should be toward the beginning of the months. Google also took its time explaining the nature of each of these builds. The first one is obvious, it is an initial beta release, expected to have bugs. The second and third betas will be incremental updates, polishing the Beta 1 and squashing most of the bugs. Beta 4 will bring the latest APIs and an official SDK. Right now, Android Q doesn’t have an official SDK number. If you want to target it, you have to set targetSdkVersion to simply ‘Q.’ Beta 4 will also kick off publishing the applications to the Google Play Store. Beta 5 and Beta 6 will be release candidates for testing and final testing, respectively. Finally, the 7th build will be a stable one. The final one will probably be the one most of you will be installing. We have a long way to go before then, but we’ll discover tons of new changes and fixes along the way. It’s going to be a fun ride.